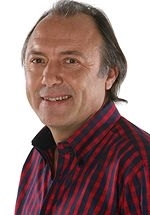 Frank Opperman is a South African actor, singer, songwriter, writer and voice artist best known for his leading roles in the television sitcoms Orkney Snork Nie and The Big Time, both of which were created by Willie Esterhuizen. Frank grew up in Pretoria and subsequently went to 11 schools from Worcester, Benoni, Hermanus, Middelburg and finally back to Pretoria where he matriculated at Silverton High School in 1978. His mother was a teacher and he was encouraged to participate in sport and Eistedfods. Although he lost interest during high school years, Frank remained a keen tennis player until leaving school. Frank started his first band in 1976, studied law at Pretoria University in 1979, got 3% for a Latin test and decided that he'd never be a judge and then did the only other job besides what he's doing now: working in Secunda on the building of Sasol 2, as an instrument fitter. He went on to join the Army in January 1980. He later met a girl who was studying drama and decided that acting seemed like an interesting job. He did his three-year national diploma in drama at the Pretoria Technicon. On completion of his studies he was awarded the Pretorian trust award for best student. He started working for PACT, the now defunct arts council, for two years. Highlights were productions like Spring Awakening and Caspar In My Tuin. Another highlight was falling asleep in a piano during a performance of The Life and Times of Mollier, and ruining an entire show. After being called up for a three month army camp he resigned from PACT and started a freelance career. He spent one year writing the television series Honnibal se Toere with Greg Latter and acted in his first feature film with Arnold Vosloo in Boetie Gaan Border Toe. Then Orkney Snork Nie, a very popular Afrikaans sitcom, came along and his name changed from Frank Opperman to Ouboet van Tonder. After that came The Big Time series in which he played a Cypriot emigrant named Chris Karedes. The Big Time garnered all the now defunct Artes awards for two years in a row and he co-wrote several episodes. In 2010 he played the title role in the SABC2 sitcom Die Uwe Pottie Potgieter. He was one of the five main credited cast members. In 2014 he had a starring role in the kykNET anthology drama series Pandjieswinkelstories (Pawnshop Stories).